Preparing to move can be a stressful a time; you’re juggling the closing and moving dates on both your previous residence and the one you’re about to move into, all while living your normal everyday life. 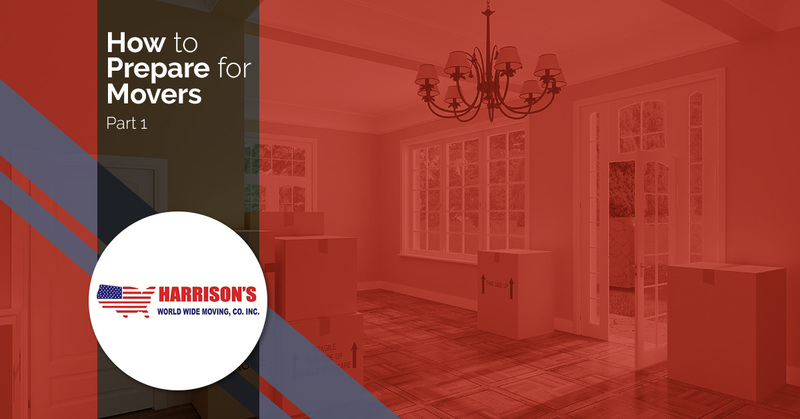 To make your life a little easier, taking advantage of full-service movers, such as Harrison Moving, will help make your relocation smooth and stress-free! Before the big transition happens, there are some steps to take to help the movers who are helping you! Every moving company has a list of items they will not move; be sure to request that list ahead of your time to prevent any further stress and headaches. The initial process will begin by going through all your belongings in each room and deciding on whether to donate, sell, or keep the items. Get organized while decluttering and purging by downloading an inventory app to keep track of your stuff. You may also want to consider giving away, to friends or neighbors, perishable food items and any hazardous materials including pesticides, motor oils, propane tanks, and any other flammable items. Next, you’ll want to box up the items and move everything into one place. Place small, brick-a-brac items in sealable bags within the boxes (such as souvenirs and desk items) when you pack to avoid delaying the movers. Remember to label every box with as much detail as possible, so the items can be placed in the new space more easily. Also, note any specific care instructions or anything else the movers might need to know. PRO TIP: Use storage bins instead of boxes. Storage bins stack and store easily, and will last a lot longer than boxes. They also keep your belongings from water damage. Separate any items or boxes that the movers should not pack or move on to the truck. It’s helpful to designate a specific room in your house and label as a “no-pack/no-entry room.” This room might include personal and private documents, valuables, and items you need in your everyday life (cell phones, computers, chargers, etc). It would be of value to have a moving route in your house mapped out, at least in your mind, for the movers to follow. Measure both doorways and large items (such as furniture) to ensure an easy exit for all your items. Above are a couple helpful tips to help you prepare before the movers arrive. Stay tuned for our next blog for additional tips on preparing for the big move! If you’re looking for a reputable company to help you move, check out Harrison Moving for all your moving needs!